Our goal is to reduce waste. Working with us to implement an effective recycling program at your business will save money and help to promote our community's goal of Zero Waste. On average 60 to 90 percent of waste generated in commercial businesses can be recycled.The more you recycle the more money you save and more importantly the more you help conserve resources and protect our environment. 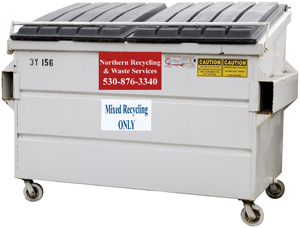 NRWS offers weekly commercial refuse and recycling services throughout Butte County. 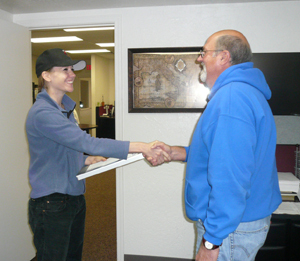 Because of our diverse and rural community, all rates for services are quoted through our customer service department. All our staff is local and available Monday - Friday 8 a.m. to 5 p.m., please call us at 876-3340. To maximize recycling, the study analyses your businesses refuse, targeting what you waste to help find ways to save you money. First step is to call us at 530-876-3340. Our hands-on experts make the transition to recycling fast and easy by customizing recycling strategies to fit your business. Call today to make an appointment 530-876-3340. We provide mixed recycling containers that are clearly labeled and can accommodate all recyclable material generated in a business environment. All fiber, newspaper, junk mail, magazines, glass, plastic and metal can be combined in one container. We provide waste audits, training, presentations and reports free of charge to help establish your waste diversion goals. Blue carts are 95 gallons. White Bins are available in 2, 4, or 6 cubic yards. Carts are picked up bi-weekly and bins are picked up weekly. Additional pick-ups per week are also available depending upon the needs of your business. For more in depth information related to your business and its needs,please contact our customer service department for more information or to set up an individual site assessment / waste audit with our Recycling Coordinator. Put all recyclables (paper, bottles, cans, plastic, metals, etc.) together. Please remember to flatten boxes, empty containers, and keep recyclables loose (avoid plastic bags, string or tape). For a complete list of acceptable items – Click here. Carts are 95 gallons. Yard waste consists of grass clippings, leaves, garden pruning's & branches 3 ” diameter or smaller. Please no rocks, dirt, animal waste or painted wood. Items outside the cart will not be picked-up. Only company-owned containers will be serviced. Carts are serviced bi-monthly. 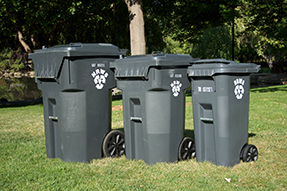 35, 65, & 95-gallon refuse carts are available for commercial customers and are collected one time per week. Placement of carts is site specific and will be addressed upon initiation of services. 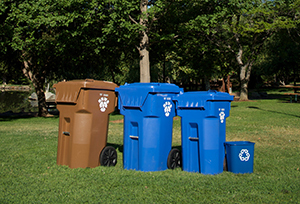 Bins are available in 1.5, 2, 3, 4, & 6 yards The amount of pick-ups per week for commercial refuse containers is assessed by your individual business needs. We offer up to 6 times per week service. For more in depth information related to your business and it’s needs, please contact our customer service department. When contemplating a new facility construction, it is helpful to contact our staff to review plans and ensure proper space and location for the garbage and recycling containers. Please call the office at 530-876-3340 for further information. Debris Box Rental - for large amounts of refuse. Please contact our office prior to your service day if you find that your total amount of waste exceeds the capacity of your container. "Extras" include any refuse or yard waste placed outside, on top or around the container, and will be picked up for a nominal charge. If you are in need of a container larger than just a few extra bags please contact us about utilizing our 4 to 6 cubic yard containers called "temp bins." 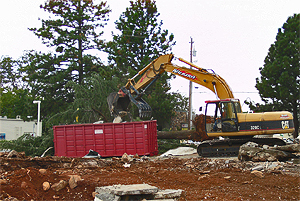 For larger jobs, inquire about the rates on a 20,30, or 40 yard debris box. And remember the more material you separate out for recycling the more money you save; we offer reduced rates for recycling a yard waste bins. Special pick-up of large items or extra debris are available if needed. Please note that any estimates given over the telephone are subject to change when the driver assesses the quantity of the load. A 24-hour notice is required for special pick-up requests. Billing for Commercial service is monthly. Please contact our customer service department for more information about what day we service your area and for additional information related to your service needs. Online payment is available, as well as after hour drop off at our office. Special events provide a great opportunity to recycle…do you wonder why it is missing at so many events? NRWS is committed to increasing recycling at events and helping you make it work. When you call us for service for your event we’ll help you select the right recycling and trash containers for your needs and we’ll provide guidelines for successful event recycling. 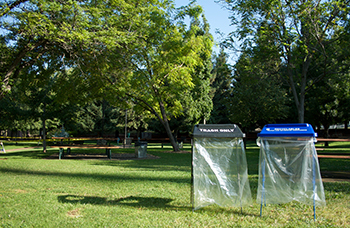 State and County policies require recycling at large events. Plus, recycling will save you money because there is no charge for separated recyclables at events…while there is always a charge for trash collection Click here for more details. What happens to your recyclables and yard waste after you put them in your curbside carts? 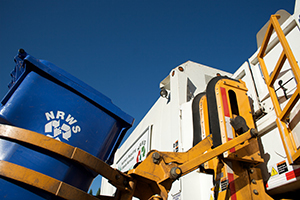 NRWS is in the forefront of recycling and our customers are largely responsible for that. 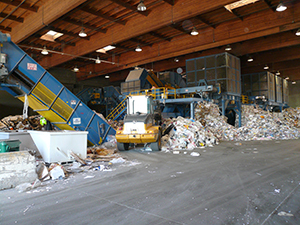 We invite your organization, business, or school to take a tour and see our recycling and composting facility first-hand. We are also available for presentations about the economic and environmental benefits of recycling, composting, and general environmental education– we’ll modify our presentation to make it age appropriate. Click here for more details.